The National Literacy Trust leads our literacy working group for Impact Goal 1, and in December 2017, launched the Read On. Get On. (ROGO) Index, a new robust measure of children’s reading at age 11 in England that looks at cognitive skills, affective processes and reading behaviours. Our Numeracy working group for Impact Goal 1, led by Achievement for All and KPMG, is working to identify and share best practice early years and primary mathematics teaching and learning case studies. The focus is on the development of maths culture across the setting or school and how this strongly contributes to raising children’s achievement and enjoyment of maths. The examples can include whole setting or school approaches as well as effective interventions. Our Impact Goal 3 working group, led by Family Link and Canterbury Christchurch University, surveyed more than 500 school staff about social and emotional health in education, and in June 2017 published the results. Our report identifies some of the reasons why emotional health remains a significant issue in the education system, where there is existing good practice, and provides support for school staff and policy makers to take action. Insufficient time (71%) and a lack of available budget (59%) were cited as the biggest barriers to addressing Social and Emotional wellbeing in schools. 94% thought it was very important to identify children who require specialist support for wellbeing or social and emotional development. Having clear next steps for pupil development (83%) and being easy to use (70%) were identified as being the key priorities for social and emotional wellbeing measurements. Our Impact Goal 5 working group, chaired by the Access Project, commissioned research into the use of contextualised admissions by universities. 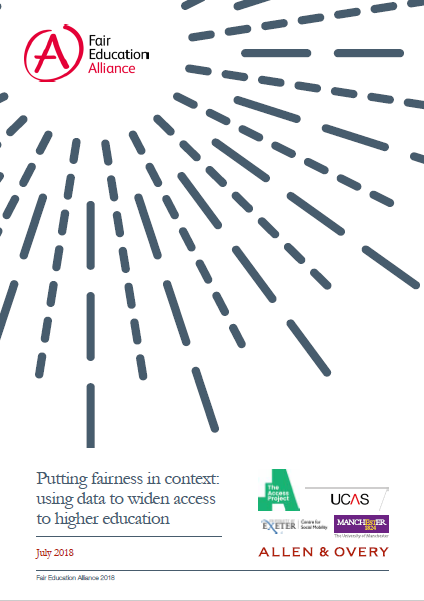 The research was carried out by the University of Exeter, and our report, published in July 2018, called for action to improve the effectiveness of use of contextual data based on best practice from across the sector.